The nomination of one of President Donald Trump's circuit court nominees was withdrawn just minutes before the Senate was to vote on his confirmation. Ryan Wesley Bounds, nominee for United States Circuit Judge for the Ninth Circuit, testifies during his Senate Judiciary Committee confirmation hearing in Dirksen Building on May 9, 2018.Tom Williams / CQ-Roll Call,Inc. 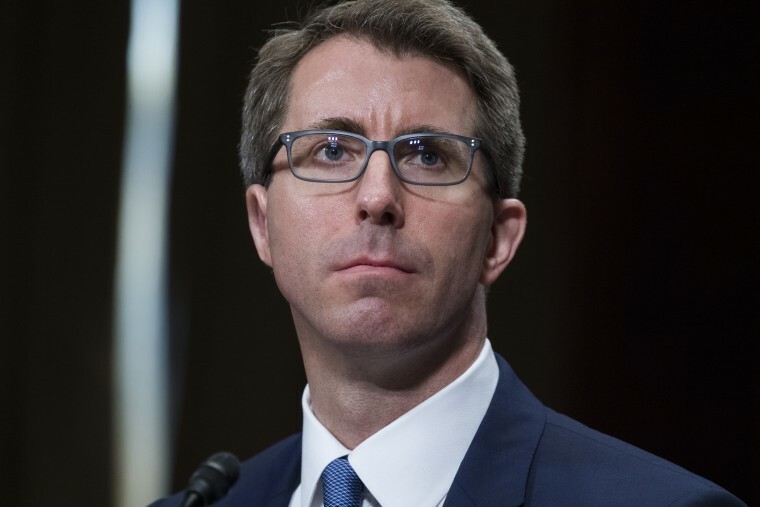 WASHINGTON — The nomination of one of President Donald Trump's circuit court nominees was withdrawn Thursday just minutes before the Senate was to vote on his confirmation. The nomination of Ryan Bounds was dropped because of concerns by two Republicans about Bounds' college writings where he was critical of diversity. Sen. Tim Scott, R-S.C., was the initial GOP senator who defected and was joined by Sen. Marco Rubio, R-Fla., after the two discussed the issue. Because of the narrow Republican majority in the Senate and unanimous opposition from Democrats, Senate leaders could afford just one Republican defection to keep the nomination alive. "The information I had was insufficient for me to be a 'yes' vote and therefore I was looking for more information that has not yet been provided," Scott told reporters. Bounds writings at Stanford were critical of diversity efforts. He called multicultural organizations "feel-good ethnic hoedowns" and wrote that "race-focused groups" should not operate on campus, arguing that "white students, after all, seem to be doing all right without an Aryan Student Union," according to the liberal group Alliance for Justice and confirmed by a senior aide to Sen. Scott. The drama resulted in last-minute scurrying among Republicans as leaders shuffled between a policy lunch and Senate Majority Leader Mitch McConnell's office to determine how to handle the doomed nominee. Bounds, who is the current U.S. attorney for Oregon, would have been the 24th circuit court confirmation as Republicans have confirmed a record-number of circuit court judges. Democrats say that the consideration of Bounds' college writing is a precedent for taking into consideration the early work of Supreme Court nominee Brett Kavanaugh. "A lower court nominee’s college writings are relevant but a Supreme Court nominee’s White House writings aren’t? I don’t think so," Matt House, spokesman to Senate Democratic Leader Chuck Schumer said.